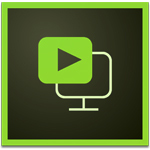 With Adobe Presenter Video Express 11 you get a personal video studio right at your desktop. Save time, money, and effort while you create and edit interactive HD videos, and transform the video viewing experience. Publish to desktops, browsers, mobile devices, and popular video portals and get analytics on content consumption. Visual representation of mouse events <>br /> Create visually rich interactive videos by adding special effects to mouse interactions, such as click, double-click, drag, and rollover, that have been captured when you recorded your video. Ensure refined sound quality and deliver an enhanced audio experience to your learners. Adobe-engineered audio filters and Acoustics Matching algorithms will automatically equalize audio levels across recorded and external video streams. You must accept the license agreement and warranty terms to use this product. See www.adobe.com/go/eulas for details. Product activation via the Internet is mandatory within 30 days from installation. See www.adobe.com/go/activation for details.